The meeting was opened by Lori Maracle at 7:07 p.m. There were 41 people signed in. President Lori Maracle warmly welcomed everyone and thanked everyone for coming out even though the weather was bad. Thank you to Steve & Jenny Elgersma, Gloria Hunter and Regina Loots for assisting Maura Cooper with the kitchen duties. The snacks were delicious as usual. Debbie Thomas explained the new setup for the Ways & Means draws. Instead of selling tickets and calling out numbers members will put their names on a piece of paper. This way we will call out the names of the winners which should be faster than checking numbers. Lori reminded members to purchase their memberships in order to qualify for the Early Bird draw. All members (present or not) who have purchased their 2014 membership qualify for the draw. Lori told the group that the Chamber of Commerce will be presenting us with a certificate acknowledging our nomination for Haldimand County Volunteer Group of the Year for 2013. 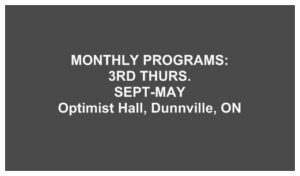 For the 2nd year in a row, we have been invited to the annual “Quint” meeting of the Dunnville service groups (Rotary, Royal Canadian Legion, Optimist Club etc). The clubs get together to discuss various projects and it’s so nice to be included in order to know what’s being planned for Dunnville for the upcoming year. Sue Mazi discussed the minutes from January. Vel LeVatte moved to have them accepted as read, and Ian Steel seconded the motion. Motion was passed. Kim Christoff discussed the treasurer’s report and updated the membership about our income and expenses for January. Lori showed everyone our new brochures for this year. Thank you to Debbie Thomas and Ian Steel for their hard work at putting these beautiful brochures together. Debbie spoke about the member panel of experts that fielded questions at last month’s meeting. Our members hold a wealth of knowledge and thank you to all who participated. Debbie also told us about the “Great Ontario Garden Guide” by the Master Gardeners of Ontario. The brochures were available for the members to take home. A display table will be available at each meeting for member to “show and tell” their favourite plants, or display odd and unusual items as well. Lori announced break time at 7:22 p.m. After a short break she introduced our speaker for the evening, Mr. Dan Cooper, author of “Gardening From a Hammock”. He spoke to our group about low maintenance gardening, and had some of his books for sale which he personally autographed. He discussed plants that required minimal watering, pruning, deadheading, and dividing. My kind of gardening. Jenny Elgersma was the winner of our 2014 Early Bird draw. The Ways & Means draws were made. Calling out names certainly made things move along much more quickly. We raised $39.00. Meeting was adjourned at 8:45p.m. Happy February everyone! I hope you have all been keeping as warm as possible. The cold weather has been relentless and I’m tired of the daily challenge of keeping my car on the road to get to work. Groundhog Day is right around the corner so hopefully Wiarton Willie will predict an early spring. One good thing about this cold weather is the possibility of the destruction of emerald ash borer and gypsy moth larvae due to the extreme temperatures. Let’s keep our fingers crossed. It may not stop them completely but there’s hope that they’ll at least be reduced in numbers. January’s general meeting had a great turnout considering how cold it was. We had a few experts from our membership field questions about gardening. Thank you so much to Judy Jeffery, Beth Powell, Marlene Link and Pauline Bradford for being our “panel of experts”. We will definitely have to do this again sometime. The line-up of guest speakers for this year is exciting. 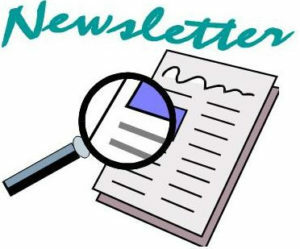 Check the list of “up-coming events” to see who is scheduled or visit our website. February’s speaker is Dan Cooper, author and master gardener. He is promoting his new book “Gardening from the Hammock”. March’s speaker is going to be Jackie Lynch, who will be talking to us about “glorious grasses for all seasons”. Your executive is working hard planning all of our activities for the year. We have firmed up the date for the Home and Garden show. This year it will be April 25-26th. We will be hosting a booth again this year so please plan on attending, and possibly manning the booth for a few hours. We are having our early bird draw at the February meeting so make sure you purchase your 2014 membership to be eligible to win a prize. Speaking of early birds don’t forget about your feathered friends during this cold weather. Keep your birdfeeders full and if possible provide water. I love sitting by the fireplace and watching the birds outside at the feeder. I honestly don’t know how they do it. If I had to run around outside looking for food in feathers and bare feetlike they do I’d be in big trouble. I would surely starve. Garden tip of the month: February may well be the toughest gardening month. Thank goodness it’s short. Since we can’t do much but sit and wait for spring to returnand for the sun to shine again it’s an excellent month for planning. Seed catalogues are arriving again. If you’re a real die-hard it’s a good time to take advantage of the occasional sunny day to get outside to clean up damaged limbs and branches from ice and snow. Sort out your garden tools and repair or sharpen any that need attention. But mostly remember to keep warm.